I am looking to ship my S1KR to Switzerland and was wondering if any of you have any experience shipping bikes to Europe from Australia. You don't say if you're looking at a temporary or permanent import, if temporary then insurance for the trip might be difficult to obtain. If it's a permanent import then you might need to be able to prove the bike conforms to whatever the Swiss requirements for lights, emissions, etc are to get it registered there. It is permanent and I spoke to a dealer in Switzerland, apparently only costs CHF300.00 for the inspection and paperwork. Sounds good! From my admittedly limited experience I'd say airfreight is the easiest way to ship if you're just wanting to move the bike and no other personal effects. 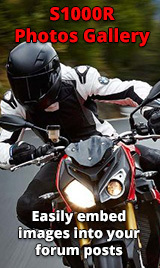 If it's a permanent import then you might need to be able to prove the bike conforms to whatever the Swiss requirements for lights, emissions, etc are to get it registered there. Switzerland is in line with EU regs, so its not really an issue as long as all the major bits are stock you can get a cert from BMW for it. Id probably expect you to pay more then 300chf all in though, ob more if a dealer helps you with the MFK. Make sure you import within 6 months or you'll have to pay the import tax as well. Hope you enjoy Switzerland, we've got plenty of fantastic alpine roads. road inspection and registration is very easy in switzerland. however you also need to pay customs clearance fees and swiss tax. the tax can be avoided if you owned the bike longer than a year and are importing it within 1 year. be aware that SpediTeam in Basel and Schumacher cargo are thieves and will charge you a few extra hundreds for customs stuff that dont need to be paid.